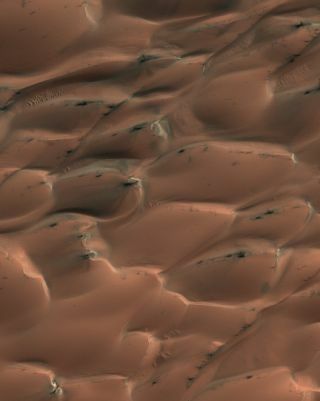 A false-color image of dark sand dunes at high northern latitudes on Mars that are covered seasonally by a layer of condensed carbon dioxide (dry ice), shown in this image. When the sun rises in the spring the ice begins to sublimate. Gas flow from the bottom of the ice layer propels sand from the dunes out through cracks to the top of the ice and down the dune slipface. Dunes in the north of Mars are not frozen in time as some have thought — conversely, their sands can shift both slowly and quickly, scientists have found. These dune fields cover an area the size of Texas in a band around the Red Planet at the edge of Mars' north polar cap. Most data suggested they were fairly static, and perhaps crusted over — relics from the past, when winds on the Martian surface were much stronger than those seen today. Now, before-and-after pictures taken by NASA's Mars Reconnaissance Orbiter taken over two Martian years — the equivalent of four Earth years — reveal a different story. "The magnitude of the changes we saw were really surprising," planetary scientist Candice Hansen at the Planetary Science Institute in Tucson, Ariz., told SPACE.com. Hansen is deputy principal investigator for the High Resolution Imaging Science Experiment (HiRISE) camera on the Mars Reconnaissance Orbiter and lead co-author of a study detailing these findings in the Feb. 4 issue of the journal Science. This time-series of black and white and false-color images, from left to right at three sites in a field of transverse sand dunes on Mars, shows that extensive erosion has taken place in one Mars year. "The first year we were looking at the HiRISE images, it was tempting to say there were changes, but it wasn't until the second year that we had something to compare our first results to," Hansen said. The secret behind these shifting Mars sand dunes is twofold — the seasonal coming and going of "dry ice" is one cause, and surprisingly powerful gusts of wind make up the other. Seasonally, about 30 percent of the carbon dioxide in the atmosphere freezes out of the atmosphere and blankets whatever pole is experiencing winter. This frozen carbon dioxide or dry ice then changes directly back to gas in the spring. "This gas flow destabilizes the sand on Mars' sand dunes, causing sand avalanches and creating new alcoves, gullies and sand aprons on Martian dunes," Hansen said. "The level of erosion in just one Mars year was really astonishing. In some places, hundreds of cubic yards of sand have avalanched down the face of the dunes." Past research with HiRISE revealed that gullies cut in smaller fields of sand dunes in Mars' southern hemisphere were linked with changes in seasonal carbon dioxide ice there as well. "It's becoming clear that there are very active processes on Mars associated with the seasonal polar caps," Hansen said. In addition, there appear to be surprisingly powerful winds at play in the north. Models of the Martian atmosphere do not predict winds strong enough to lift sand grains, and data from Mars landers such as Phoenix revealed that high winds are rare. Nevertheless, the researchers found that scars of past sand avalanches could be partially erased in just one Mars year. Three black and white and false-color images of the same location taken at different times on Mars show seasonal activity causing sand avalanches and ripple changes on a martian dune. "Perhaps polar weather is more conducive to high wind speeds," Hansen suggested. All in all, sets of images from HiRISE revealed about 40 percent of the locations in this region changed during the time analyzed. This suggests it actually ranks among the most active landscapes on Mars, even though few changes in these dark-toned dunes had been detected before there until now. "We've got to look at Mars as a place that has active geology in today's climate, not just sometime in the past," Hansen said. Future research can focus on the innards of these northern dunes. "The old conventional wisdom was that the interior of these dunes are water ice, and we need to rethink that," Hansen said. "With all the sand avalanches, we see evidence that the dunes are not cemented all that deep."